I don't bake often but when I do, I prefer to find a recipe that uses simple ingredients and that is low in sugar. 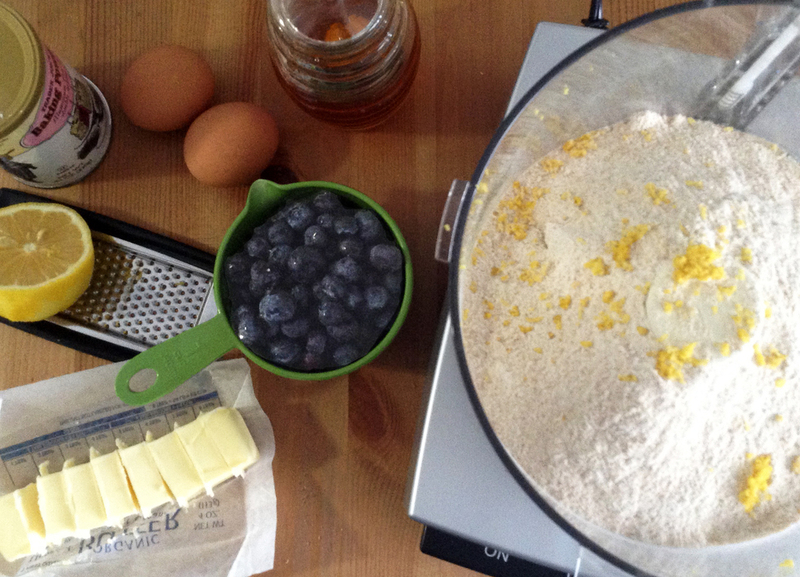 100 Days of Real Food is one of my favorite blogs and when I saw them post a recipe for Whole Wheat Blueberry Scones, I knew I had to try them. I like that they always use whole grains in their recipes and that the only sweetener in this recipe is a few tablespoons of honey. (I also used this recipe as an excuse to use the dough blade on the food processor I received for Christmas, ha) I did make a few changes, which you'll see in italics in the recipe. Enjoy! In a food processor fitted with a dough blade, mix the flour, baking powder, zest, and salt until combined. Cut the butter into tablespoon-sized chunks and sprinkle them on top of the flour mixture. Pulse until the butter breaks up into pea sized pieces. Add the blueberries and pulse again just until combined. Drop in the eggs, cream, and honey and process until the dough comes together into one ball chasing itself around the machine (or if that doesn't work, you can just bring it together with your hands). Turn the dough ball out onto a floured surface and pat down with your hands (or use a rolling pin) into one big circle that's about ¾ inch thick. If the dough sticks to your hands, pat it with a little more flour. Cut the dough into triangle shaped pieces (it helps to cut into the circular shape like you would a pie or a pizza) and place on an ungreased baking sheet. If there are any remaining scraps press them together and cut more shapes until it’s all been used. Bake for 12 to 15 minutes or until golden brown. Serve warm or at room temperature.